Actually, this is a crossover with Nobunaga’s Ambition, a venerable wargame series out of Japan, but that’s niche stuff. The kind of niche I’m into, mind you. 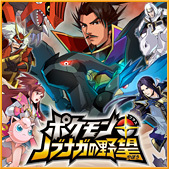 The people are similar, though: it’ll be Oda Nobunaga, Akechi Mitsuhide, Oichi, Takeda Shingen… with pokemon. Holy cow. Anyway, it’s a crossover I never expected to see. The famous generals, along with Oichi who never took a battlefield in her not-so-charmed life in real life (I think), will be shown in a more anime-like vibe as shown in the picture above. For a much larger one, you’ll need to go to the Japanese website. Apparently Oichi will be the first personage figured in a series of short manga stories that will run six volumes long. That’ll be a webcomic starting on the 16th of this month (March) according to what I read on that site. This entry was posted in Culture, Japan, video games, Weird Stuff and tagged crossover, culture, DS, Japan, Mitsuhide, Nintendo, Nobunaga, Oichi, Pokemon, Shingen, video game. Bookmark the permalink.